"I think this is the most professional looking staff! They always impress!" 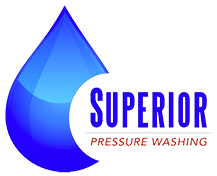 "We have used Superior Pressure Wash multiple times to power wash our house, driveway and deck, and have been super pleased every time. They always go above and beyond and their prices are fair." We excel at removing black streaks from your shingles! Our soft wash system eliminates lichen, mold, moss, and dirt from your roof. The result: Shingles that are as long-lasting as they are curb appeal ready. We utilize a soft washing solution to remove dirt and grime from your siding. This low pressure washing approach is the best way to bring the shine to your exterior, and it guarantees that ‘like new’ result for your home. Our team uses a hot water cleaning method to make sure that your gutters are ready for any weather. We provide complete debris removal, clear clogs, & deliver minor maintenance to keep your home protected day in & day out. We are your professional source for pressure washing buildings & concrete. Using hot water pressure washing technology, our technicians work with property managers & commercial sites to create a clean, safe space to do business. Our professionals bring a streak-free result to your interior and exterior windows. Offering both a water-fed pole and traditional cleaning system, we bring a customized clean to your panes, screens, sills, and frames.